“Uncle” Jay Mandao (Scott Dunn) was just awoken by his older nephew Jackson (Sean McBride) eating the last box of Mandao cereal from when his father was alive and still owned the company. Jay’s life is forever changed when he astral projects an out of body experience to the scene of a murder. With newfound powers come newfound responsibilities. A big task for an out of work guy who barely leaves his bathrobe, living a frugal existence off his deceased father’s cereal royalties and the nephew who mooches off him. With the help of a taxi driver Fer (Gina Gomez), the trio has until Halloween night to reverse the death of a ghost (David Gallegos) they found and stop Jackson’s ex-girlfriend Maeve (Marisa Hood) who’s allergic to light, has an affinity for blood and might just be a v… No, surely not. 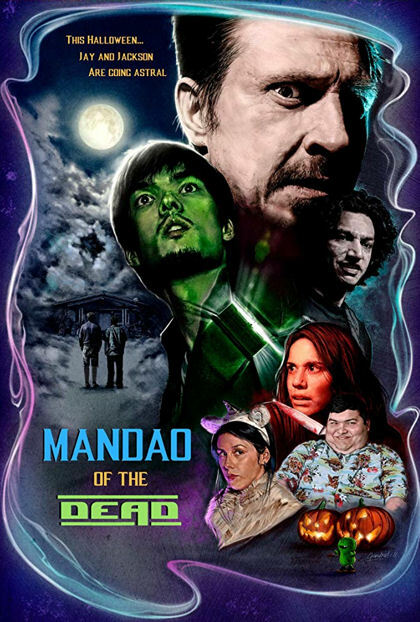 “This Halloween Jay and Jackson are going astral.” Time travel of the supernatural, Mandao of the Dead is an absolutely ridiculous comedy with a horror twist. The undead have risen in their sleep and they’re going astral. Astral projection is sleepwalking of the mind and Jay has just inherited the power to do so. He also just projected himself in the path of a ghost who needs his help. The Harold and Kumar pairing of Jackson (Sean McBride) and Uncle Jay (Scott Dunn) works. In their adventure they come across a cast of characters that include on call cabbies, recently deceased ghosts, crazy ex-girlfriends and possibly a vampire.